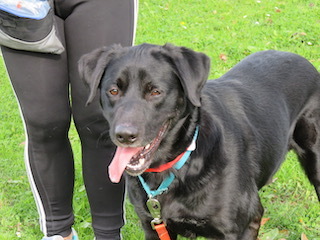 Background:	Rufus (formerly Brutus) initially came to Lab Rescue when his original owner couldn’t keep him. He was placed with a loving family, but it wasn’t a good match, and he returned to Lab Rescue. Rufus has some issues and we currently have him in a board and train program, where he is making tremendous progress! His progress is so great that we felt he needed a name change in celebration; he’s not a “brutish” kind of dog, and shouldn’t have that kind of name, so now he’s Rufus. 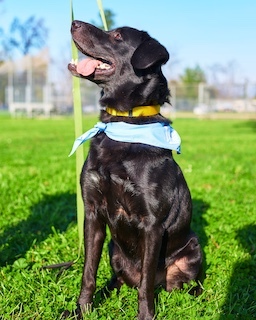 Rufus won’t go to his new home until he’s finished his program, but he’s ready now to begin meeting potential adopters! 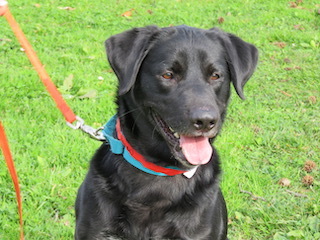 What Rufus’s family says: Rufus is a playful dog with a lovely temperament around the house. He loves to sit outside on the back porch or on the lawn. He plays very well with our children ages 8-14. He is very protective of the front door and front porch and will ward off any suspicious visitors. He is nervous of new situations but he has come a long way. His temperament with our family is great. Rufus thrives on routine (he walks twice per day for about 30 minutes each) keeping the walk route and time similar works well for us. His walking on leash is really quite good when the walks are predictably timed and when he doesn’t encounter other dogs. We have seen a lot of improvement on leash. He can be distracted with treats and LOVES a treat or a kind word or a pat on the head as a reward. He is very playful and ball driven. He would be an excellent dog for a runner. He will play for hours with the ball, particularly a green squeaky favorite one. He is mischievous and has a good food drive - (in other words, he counter surfs when he can). We are very careful not to leave food unattended on the counters - but he’s quick to find whatever he can if his humans are out of the room (or leave a backpack with a snack inside on the floor). Unfortunately, we do travel a fair amount for kids’ sports and on vacations - and had planned on taking them with us. Although he is great in the car, at this point he is not ready to be around other dogs even on leash in a park setting. What Rufus’ rep says: I am thrilled with the program that Rufus has made! He’s a super sweet dog, very treat motivated and eager to please. His progress early in his program is just amazing. He’s working in a local park with lots of dogs and other distractions, learning how to interact appropriately with other dogs as well as how to ignore them, and he’s responding well to commands like Sit and Watch Me. We think that his issues stem from not having been taught early in life what the rules of the road are for a well-behaved Lab, but he’s learning that now. Although Rufus looks like a big confident dog, he’s really a sensitive boy with some insecurities especially around things that are new or strange to him. He may have been overly corrected in his past, as he sometimes flinches when a hand is raised or when he is scolded. He loves to play, and will play Fetch until your arm drops off, making this a good part of his exercise routine. He’s still young, and needs lots of exercise; 2 45 minutes sessions a day should do it! Regular brisk walks or jogs and ball time would make him a very happy boy (and a tired dog is a good dog!). The ideal owner for Rufus is one who is experienced dogs and very consistent with the rules; for Rufus, consistency & training will be key to being a great companion dog for some lucky family. He would be fine in a home with dog savvy children over the age of 10 (partly due to his size, and partly due to the need for consistency). Rufus would do best as the only dog in the home and that’s what we want for him. He would NOT do well in a home with cats. 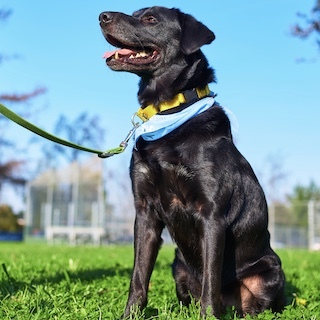 We’ll be holding adopter meetings with Rufus at the board and train facility so potential adopters will have an opportunity to ask questions of the team working with him, and to learn more about ensuring his success once he’s graduates from the program. We’d love to have his new home waiting for him by the time he completes the program! Medical Information: Rufus is neutered, current on shots, heartworm negative and taking preventative. Note: If we do not have a permanent home for Rufus by the end of his program, we will be looking for a foster at that time so he can be in a normal family environment. If you are interested in fostering Rufus while we look for his permanent home, contact Rescue Rep Debbi at dragonflydebbi@gmail.com. If you think you are the one for Rufus, please contact Rescue Rep Debbi at dragonflydebbi@gmail.com . 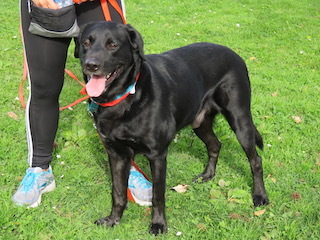 In your email please tell me about your experience with Labs/rescue dogs, how you would help Rufus with his ongoing training, and the kind of Lab you are looking for. Rufus needs a home without other dogs or cats.